Six days before Kezia Dugdale resigned as Scottish Labour leader, she was out on the streets of Cardonald rallying supporters for the forthcoming Glasgow City Council by-election. If she was struggling to cope, then she kept it to herself. “She seemed upbeat, resilient; there was no indication she was going through any kind of crisis,” one insider told me. Over the weekend, however, she told her mentor and father figure, former leader Iain Gray, she was planning to quit. He pleaded with her to change her mind, but to no avail. So, on Tuesday morning , she emailed her aides and advisers to break the news of her imminent departure. At noon, she told members of the Scottish Executive Committee. Most MSPs didn’t find out until 10pm, shortly before it was made public. On a logistical level, the timing of her departure makes some sense. If she had resigned straight after the general election it might have taken some of the lustre off Scottish gains; if she had done it over the summer, she would have denied party workers much-needed time off. Doing it now allows her deputy, Alex Rowley, to start the new session as interim leader while preparations for the Scottish leadership election get under way. Yet the extent to which her decision came as a bombshell – a clusterf***, as some have dubbed it – cannot be overstated. As they lick their wounds and contemplate the third Scottish leadership election in as many years, her allies seem torn between their admiration for the way she stepped up when the party was in the doldrums, and a sense of betrayal. “The irony is that there have been lots of times over the past year when I have thought things might have been getting too much for her: when Gordon died, when she split up with her fiancée, Louise [Riddell], when she was being sidelined by Jeremy Corbyn,” an insider says. Some argue Dugdale was under siege from left-wingers, who regard her as hostile to the Jeremy Corbyn “project”. Last week, as the UK leader prepared to tour marginal seats in Scotland, the bi-monthly magazine Scottish Left Review was said to be calling for both Dugdale and Scottish general secretary Brian Roy to be replaced. They were looking for a pro-Corbyn appointment to take the Scottish leader’s seat on the National Executive Committee, thus shifting the balance in his favour. Yet now she’s gone the two most obvious left-wing candidates to become Scottish party leader – Rowley and Neil Findlay – have ruled themselves out, suggesting rumours of an imminent leadership challenge have been greatly exaggerated. “There was no turmoil, no civil war – there was just the usual internal Labour left-right backbiting which goes on forever,” an insider says. The Cardonald by-election, prompted by the death of councillor Alistair Watson, is one of two taking place on the west coast on Thursday, the other being in Fortissat, North Lanarkshire. Some MSPs believe Dugdale’s fledgling relationship with SNP MSP Jenny Gilruth may also have been a factor. When the pair announced they were seeing each other, social media was awash with praise for their across-the-political-barricades romance. But most people privately acknowledged it would be a challenge, particularly given that Dugdale would have been launching weekly attacks on the SNP’s education policy and Gilruth is parliamentary liaison officer to Education Secretary John Swinney. The romance would also have been be grist to the mill for those critics who continue to believe Dugdale secretly harbours nationalist tendencies. “These accusations are unfair – Kezia has proved time and time again she is committed to the Union – but she has found it difficult to throw them off, and this relationship might not have helped,” says another source. Looking back over her turbulent two years, the surprise is perhaps less that Dugdale has resigned than that she tholed it for so long. A late starter politically, she made no secret of the fact she lacked an appetite for the job, preferring the role of “sidekick” which she played to good effect to Jim Murphy. When he quit, in the wake of the disastrous 2015 general election results, it was clear the job was a poisoned chalice; in any case, it had come too early for Dugdale. Elected MSP in 2011, she had impressed as a social campaigner, but needed more time to hone her front bench skills. Still, with Ken Macintosh the only other candidate, she felt she had no choice but to sacrifice her own best interests and go for it. Even the most gloomy seer could not have predicted what the next 24 months would bring; at a time when Dugdale should have been shoring up the battered ship, she had to steer it through the choppy waters of: the 2016 Holyrood election, the EU referendum, a national Labour leadership election, the 2017 council elections, and a snap general election. As many have pointed out, she did it all at a time of huge personal upheaval; being outed (she now claims) as gay, and losing Riddell and Aikman in quick succession left her isolated and emotionally depleted. Nor did she always find the role fulfilling. Add to all this First Minister Nicola Sturgeon’s decision to reveal the details of a private post-Brexit telephone conversation, in which Dugdale suggested she might back a second independence referendum; the frustration of working with Corbyn, a politician with scant interest in and understanding of Scotland; and her SNP-voting father Jeff’s penchant for unsupportive tweeting, and you can only admire her ability to keep her head above water. Certainly, Dugdale has made mistakes. Her tendency to do her thinking out loud – à la her occasional flirtation with independence – could make her seem fickle, and her affability and reasonableness meant she wasn’t always prepared go for the jugular. Though she mostly stuck to her principles, she could equivocate, wavering for example, in her support for the Named Person provision in the face of an orchestrated campaign, and her prevarication over her party’s position on Trident caused confusion. But there are many things to praise her for too: she has a gift – her friends say – for bringing people who might not seem like natural fits on board and she fought hard on gender equality issues, setting up Women 50:50, and successfully pushing the party to pursue 50 per cent women candidates in all major elections. 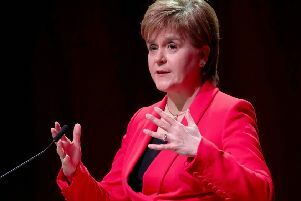 She rid Scottish Labour of its “branch office” tag, securing a degree of autonomy, and the now contentious NEC seat for Scottish leaders; she embraced federalism in an attempt to solve her party’s constitutional dilemma; and one of her crowning moments was a storming speech on the two-child cap on tax credits, during which she read out a letter from a constituent who had become pregnant after being raped. Backing Owen Smith for leader was, by general consensus, Dugdale’s worst mistake. It allowed her to be portrayed as out of step with the Corbyn project, with any kudos for the six seats gained going to the UK leader and his supporters. Yet many in the party believe Dugdale has been misjudged and undervalued. She has found it difficult to shake off the perception that her affiliation to the party is superficial. This perception stems from the fact she started attending Labour meetings while at a loose end and has been reinforced by the revelation she once applied for an internship with SNP MSP Richard Lochhead. The implication is that Dugdale had an inclination towards progressive politics and made an arbitrary decision to hitch herself to Labour’s wagon. But one insider said they admired the way Dugdale’s youthful ambition had matured into a passion for social justice. “If you look at her payday loan campaign – it was typical of a modern style of campaigning: identify a high-profile issue, something that is likely to get you noticed, and back that,” says the source. “But I saw Kezia grow from someone who launched ‘campaigns’ to someone whose starting point was to work out what was wrong and then to try to do something about it, even if it was likely to be difficult. Many of those in the party insist Dugdale’s 2016 manifesto – in which she pledged a 1p tax hike on those earning more than £21,500 and a 50 per cent top tax rate – was more radical and left-wing than Corbyn’s. “I thought Kezia was courageous, but in Labour you are defined by who you support rather than what you believe in,” says one insider. Another source said the way Dugdale was pigeonholed was an indictment of the binary nature of political parties. “There are aspects of Kezia that are left-wing, and there aspects of Kezia that are slightly to the right, but when you are in a party full of factions, there is no nuance: you are for us or you are against us. There are also suggestions that Dugdale wasn’t willing to schmooze people whose support might have proved useful under pressure. Whatever, she found herself increasingly at odds with the likes of Neil Findlay – whose forthcoming book Socialism And Hope is reported to be a savaging of Blairite politics – and Rowley, who is said to have undermined her. With a limited hinterland, and two of her closest friends gone, Dugdale had few people to lean on. A determination not to appear weak meant she continued to bear the burden of power alone. Though her departure has left the party in disarray, her resignation speech was made with a dignity that characterised her time as leader. Unlike Murphy and his predecessor, Johann Lamont – who was forced out after the referendum – Dugdale has taken control of her own destiny, leaving at a time of her own choosing. Referring to Aikman, she told Taylor: “He taught me how precious and short life was and never to waste a moment.” Whatever Dugdale does next as MSP for the Lothians, she is unlikely to do it with anything less than gusto and conviction.